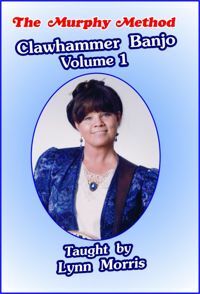 Clawhammer Banjo Volume 1: Sometimes playing the banjo bluegrass style just doesn’t do it for you. Or perhaps you just want to investigate this thing called “clawhammer.” (Also called “old-time” or “frailing” banjo.) Nowhere will you find a better guide and teacher than the multi-award-winning Lynn Morris. Lynn has flat-out taken the mystery out clawhammer playing! She has broken this pre-bluegrass style into small segments so that you can learn it easily. Using the frailing strum, Lynn takes you through 5 songs in note-by-note detail. Introduces double C tuning. No Tab.